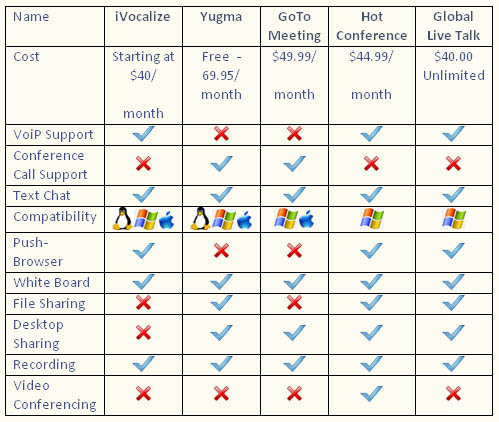 There are two types of Web Conferencing services available: VioP (voice over IP) and Conference Call Supported. VoiP supported means that the program will include the ability for you and your guests to speak in the room via a microphone attached to the computer. Conference Call supported means that the service does not include VoiP and you will need to call in to a conference call line on your telephone. · $40.00 /month: 1 room, unlimited seats and unlimited usage. No control panel or corporate branding of room. · $50.00 /month: 1 room, unlimited seats and unlimited usage. Control panel and corporate branding included. · VioP supported; you do not need a phone or conference line. · Unlimited seats so you can have 1 or 100 guests in the room at one time. *Please note that Platinum Synergy can not provide technical support for these services. Each service has its own technical support system that you would need to contact.